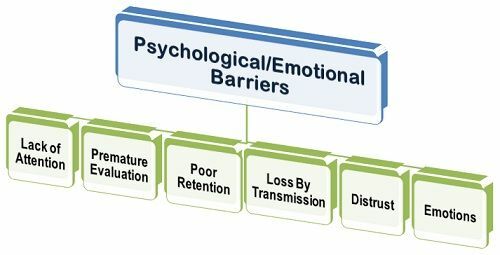 Definition: The Psychological or Emotional Barriers refers to the psychological state i.e. Opinions, attitudes, status consciousness, emotions, etc. of a person that deeply affects the ability to communicate. The communication largely depends on the mental condition of a person, if the person is not mentally or emotionally sound, then he cannot communicate effectively either as a sender or a receiver. Lack of Attention: When the person is pre-occupied by some other things and do not listen carefully what the other person is speaking, then arises the psychological barrier in the communication. When the person does not listen to others, then he won’t be able to comprehend the message as it was intended and will not be able to give proper feedback. Premature Evaluation: Many people have a tendency to jump to the conclusions directly and form judgments without considering all the aspects of information. This is generally done by the people who are impatient and resort to a selective listening. This premature evaluation of the information acts as a barrier to the effective communication and lowers the morale of the sender. Poor Retention: The retention refers to the capacity of a brain to retain or store things in the memory. The brain does not store all the information came across but in fact, retain only those which deems to be helpful in the future. Therefore, much of the information gets lost during the retention process, and this acts as a barrier to the effective communication. Loss by Transmission: The loss by transmission means, whenever the information exchanges hand its credibility reduces. It is most often observed in the case of an oral communication where people handle information carelessly and transmits the information which has lost some of its truth. Thus, the improper and lack of information being transmitted to others acts as a hindrance in the communication process. Distrust: To have an effective communication, it is must that both the communicators (sender and receiver) trust each other. In case there is a lack of trust between both the parties, then they will tend to derive negative meaning out of the message and often ignore what has been communicated. If the receiver has no trust, then he will not listen to whatever is being said by the sender, and this will result in a meaningless communication. Emotions: The communication is greatly influenced by the emotions of a person. If a person is not in a good temperament, then he would not listen properly to whatever is said and might say things offending the sender. Several other emotions such as anger, nervousness, confusion, restlessness, etc. affects the communication process. Thus, every human being has a unique mind which is composed of varied emotions, beliefs, perceptions, opinions, and thoughts that facilitate different forms of communication. this has helped me a lot thank you! !